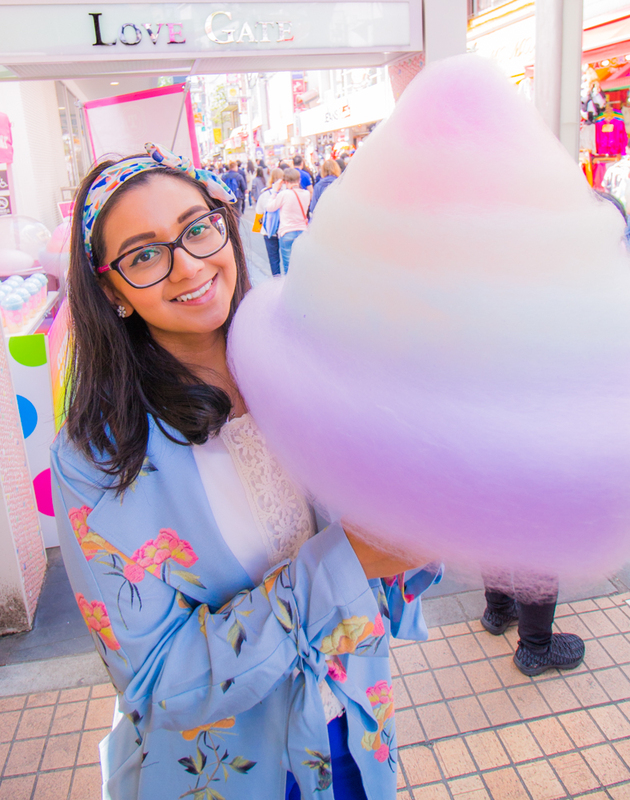 Welcome to the first in a series of blogs to help you make the most out of planning your trip to Japan, during cherry blossom season. This was our most overwhelming trip to date, with so much to see and do, amongst the hustle and bustle of the crowds, and in a land where we don’t speak the language. However, with the right amount of planning and research, there’s no reason why you can’t have the most amazing experience visiting Japan. We visited Japan towards the end of cherry blossom season in mid April, so were lucky to still find some late bloomers. Due to the sheer volume of information and photos we have to share with you, our first blog will give you an overview of how we planned our trip and our itinerary for the trip including the areas of Japan we visited. The rest of the series will have blogs about our Tokyo highlights; Kyoto highlights; our day trip to Kawaguchiko and Mount Fuji from Tokyo; the hotels we stayed in; and a general blog with tips, advice and information on travelling, money, etiquette and other useful bits of information. We hope you will follow our blog (just enter your email address after clicking the link on the right hand side if you’re on a PC or at the bottom of the page if you’re on a phone), and if you’re on Instagram, follow us on @thedjklife to keep up to date with our photos, blog entries and future travels. Flying to Tokyo from Glasgow was our longest and farthest journey, so we were dreading the air travel there! We flew Emirates from Glasgow International to Dubai, which took around 7.5 hours. Following a 2 hour transit, we flew Emirates again from Dubai to Tokyo, which took 11 hours. Having left on Saturday afternoon around 2pm, we arrived in Tokyo on Sunday evening around 5.30pm. We love flying Emirates because so far we have had great service, with no major problems. Our economy seats were relatively comfortable given the long duration of the flights, and the in flight entertainment as usual was enough to keep us occupied, when we weren’t sleeping. We had 8 full days in the country, and wanted to fit in both Tokyo and Kyoto, including a day trip to view Mount Fuji. We decided to sandwich Kyoto in the middle of the trip (and over Jonathan’s birthday), giving us the days on either side to explore Tokyo. We arrived at Tokyo Narita Airport at half 5 in the evening. Narita Airport is further away from the center of Tokyo compared to Haneda Airport. So if you have a choice and if your airlines allows, it is preferable to fly to Haneda Airport. After claiming our checked in baggage, we took the Airport Limousine bus to our first hotel – the Prince Park Tower Hotel. The journey took us 1 hour 50mins during Tokyo’s rush hour traffic – although the traffic is probably always the same, no matter what time it is. Alternatively, we could have taken the train/subway and then walked to get to our hotel, which would have been quicker and cheaper. However, at that time of night, it was convenient for us to just sit on a bus, and be taken directly to the doorstep of our hotel. We will be writing a blog about the hotels we stayed in, so we will spare those details here. We will also be covering travel details in a future blog. By the time we arrived at our hotel, it was pretty late at night. So, after checking in, photographing and videoing the room, and admiring the view, we only had time to find a restaurant at our hotel that was still open for dinner. Our hotel was situated in Minato, so it made sense to take a look at some of the nearby temples and shrines. We didn’t have to try very hard, as we walked past a few on the way to the subway station. Our hotel room also gave as a private view of the Tokyo Tower, and we kept walking past it to and from subway stations. Shibuya was the first area on our list to explore, so we took the subway there to see the famous Shibuya crossing. From here, we walked to Harajuku to experience the wacky, colourful shops and streets and check out the unique looks and outfits. 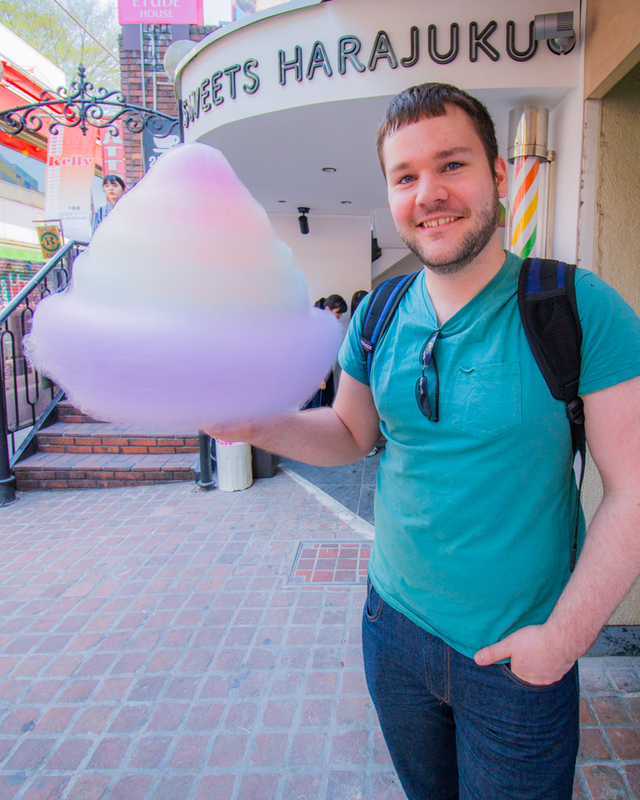 We also wanted to find the famous rainbow candy floss. We went on to Chiyoda, to visit the gardens of the Imperial Palace and Chidorigafuchi park on our quest to find sakura trees. Unfortunately, the Imperial Palace was closed that day and although we did find Chidorigafuchi Park, we couldn’t find the boating area which was supposed to be surrounded by the sakura trees. So, we returned to these places the following day. Ginza is a shopping district close to the Imperial Palace so we walked there to do some window shopping. From the Tokyu Plaza shopping centre, we discovered you can get a great bird’s eye view of the Ginza crossing, which looks much cooler than the Shibuya crossing. Chiyoda is the area where you can find the Imperial Palace & Gardens, and within walking distance of this, Chidorigafuchi Park, which during sakura season, give you some of the best cherry blossom trees – unfortunately, we were too late to catch them here as they had already bloomed and gone. However, we still managed to find some beautiful flowers in the Imperial Palace Gardens. From here, we jumped on the subway again to Akhibara – gaming, anime and technology central. If we had to do it again, we would also visit Akhibara at night, so you can see the columns and columns of flashing neon lights and signs along the streets. Ueno was next on the list. Ueno Park is another cherry blossom hot spot (which again we missed). It also has a shrine with mini Torii gates, similar to the ones of the famous Fushimi-Inari shrine in Kyoto, so you can take some practice shots, before visiting the real thing. It also has a couple of different temples and shrines within the park and a zoo alongside it! You could easily spend a whole day here if you wanted to. By the time, we walked around Ueno Park, we were ready for a rest and headed back to the hotel for a nap. In the evening, we headed back to Shibuya, to take some photos of the crossing at dark. Our first time on the Shinkasen bullet train, we made our way to Kyoto, where we stayed in the geisha district of Gion. After checking into our hotel – Hotel Ethnography, we spent the whole day exploring 2 different nearby temples which had lots of different pagodas and shrines within it. We didn’t have to get any public transport, as these were all within walking distance – more on our Kyoto blog coming up. Oh! We finally found some cherry blossoms in Kyoto! This is where you come, if you miss them in Tokyo. Jonny’s birthday! We headed out to Arashiyama by bus from Gion. Here, we visited the beautiful bamboo forest and local shops. Following Arashiyama, we took the bus back to Gion, and changed buses to get to the Golden Pavilion Temple – Kinkaku-ji, where we arrived just in time before last entry at 1630, to be able to take our ‘golden shots’ at sunset. When we arrived back at Gion in the evening, we revisited some of the shrines as they looked beautiful lit up at night. We also visited one of the streets in Gion, which were frequented by geishas and meiko to try and get a glimpse of them. We saved the best Kyoto landmark till last (if we could pick a best one that is) – the Fushimi-Inari shrine. We checked out of the hotel, left our suitcase there to collect later, and got a train to Fushimi-Inari. I think this was the most famous and photographed Kyoto landmark we had come across before our trip. It was a beautiful hike to the top of the shrine and back down to the bottom again. Make sure you take comfortable shoes! There were a couple of temples back in Gion, we wanted to visit again as we hadn’t had a chance to see them in the daytime. After checking them out, we picked up our suitcase and made our way back to Kyoto station by bus. Time to get our bullet train back to Tokyo and check into our third hotel – Keio Plaza Hotel in Shinjuku. Staying in a different part of Tokyo this time, put us in closer proximity to some of the other areas of Tokyo, we had yet to visit. Shinjuku reminded us of New York – busy streets, offices, tall buildings and skyscrapers. There was a even a Times Square and a building that looked like the Empire State building! Shinjuku station is one of the busiest stations in Tokyo – and luckily it was very close to our hotel, making transport by bus, train and subway quite easy. Shinjuku Gyeon National Park was walkable from Shinjuku station, and still had some cherry blossoms alive and we thrilled taking pictures with them! This was the only park we visited which required an admission fee – but it was cheap and worth it! We took a day trip from Shinjuku station to Kawaguchiko by bus. Here you can visit Lake Kawaguchiko to get views of Mount Fuji across the lake. We also took a train to nearby Shimoyoshida, where we visited the Arakura Sengen Shrine where you can find the picturesque Chureito Pagoda. Further blog on this day trip and more photos coming up! On returning from our day trip, we checked into our fourth and our ‘splurge’ hotel – the hotel with the best views ever …and really, the best hotel room we’ve ever stayed in – Andaz Toronoman Hills. We made the most of our last evening in this fabulous room, by having a quiet night in enjoying the views and relaxing. Our final day in Japan! We didn’t have the entire day to explore, as we had to travel to Narita Airport in the evening to catch our flight at 2200. We visited Asakusa to visit Senso-ji temple and the surrounding area. We also did most of our souvenir shopping here, on the street between the Hozomon gate and Senso-ji temple. We had planned on visiting the Tokyo Skytree from here by subway – however we decided to skip this as there were delays in the subway line and we didn’t want to rush to catch the train to Narita Airport! Back at Narita Airport, we awaited our Emirates flight back to Dubai, and then back home to Glasgow. So, this was an overview of our trip. Let us know if you’ve got any comments, thoughts, feelings, questions!